The Bear Grass is outrageous this year. When the temperatures reach 100 degrees its far to hot for riding. We must be in the saddle by 5am and done by 11am. After leaving Carol Guthrie’s lovely home feeling encouraged and satisfied with our work on my book, I rode north back to Paradise for a return visit at Paradise Fjord’s – and new friend Nancy Beech, (see story in previous posting) Nancy not only owns Paradise Fjords but is an organic farmer and owns Mountain Spring Farms. She raises garlic, blueberries, cherries and potatoes, I know I am forgetting some of her produce. Here she is resting after a very hot day! Nancy at the end of a grueling hot day of farming. Debbie York, Associate member of the Long Riders Guild. She’s moving to Plains from New York! 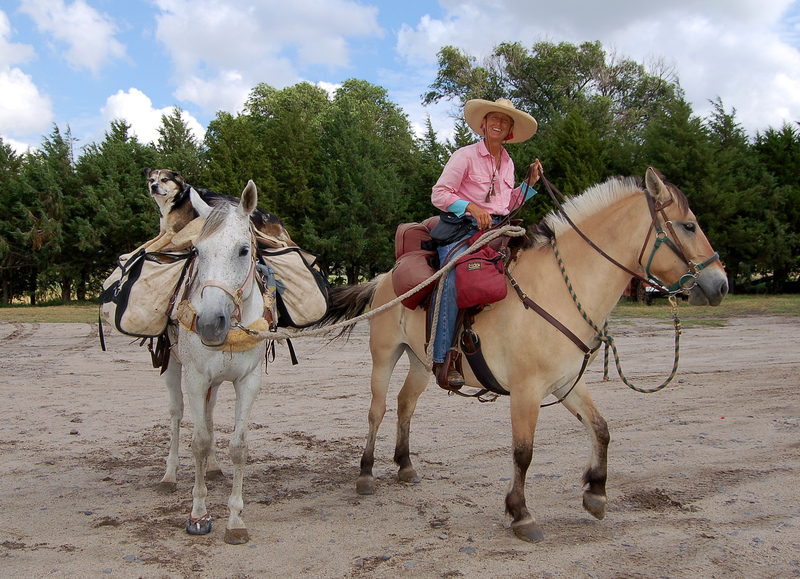 Sandy Spineler came walking over to the horses pushing her bicycle I am not sure how old she was but she said, “I’m in heaven,” when she gave Spirit a hug. She brought out photos of her as a 16yr old riding a big palomino horse in 1959. Libby, Montana was dancing on its toes with summer tourist activities when I rode into town and settled down at J. Neils Park. I’d completely eaten all of my food before coming in so I swung down main street for Rosauers Grocery Store. 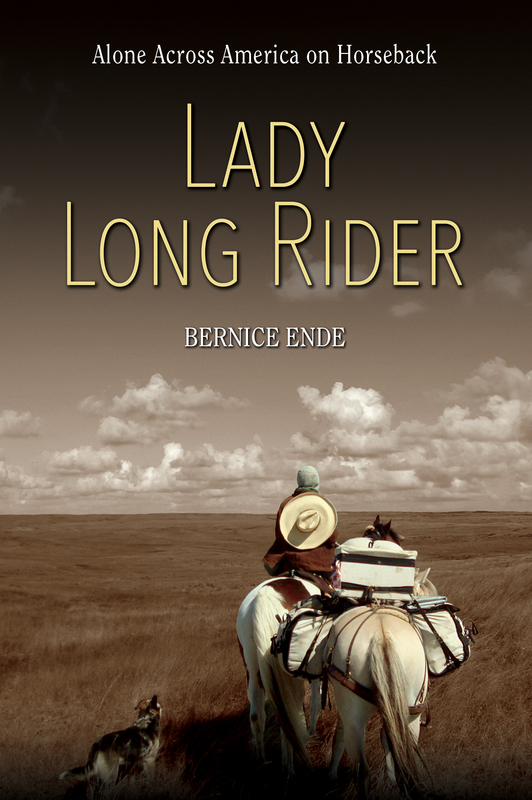 While there 3 women came out with big smiles on their faces from the near by campground, “Are you Bernice Ende?” For 3 years they’d been traveling the United States. They were from Colorado and had been following my rides since 2007, I think they said. They held the horses while I dashed in for food, buying way too much, everything looked good!. THEN standing in the check out line a woman touches my are and said, “Do you remember me?” “YES.” I’d met them a few years earlier on a ride into Libby. She and her husband insisted on paying for my groceries.Here’s the carry out boy, Nate with a surprise on his face. “Have you ever packed a pannier?” I asked him. “AHHH No.” lots of fun. The day before I rode into Libby I got a view of this. The LDS – Latter Day Saints were doing a reenactment. I asked one of the outriders on a mule what was going on and he said, “They were commemorating the 100 year date when they were run out of Missouri.” I would imagine if was for the polygamy practice. Then, as I rode into Libby I rode past this…A group of workers from Habitat for Humanity, putting a house back together. And I thought, goodness this is truly America and I feel encouraged and hopeful. But then I read in Libby’s local “Montanian” newspaper that huge budget cuts will be made to our libraries, NO. NO. I say. I ride with Susan B. Anthony and Sacajawea dollar coins. Seems appropriate. When I rode thru Plains, Mt. (the first time this year) I spoke for a group of 6th graders on a field trip to the Bend Guard Station north of Plains about 30 miles. One of the projects they did was to make beaded necklaces. after they were done a young gal named Issy Crabb placed her newly made necklace around my neck. I added the coins. Sacajawea came from Burton Robson and Susan B. Anthony came from I don’t know where but I do like having the women around my neck. Heading back north to the cabin, getting ready for the next jaunt east, Helena and back. Will visit FarCountry Press, the publishers handling my book. Hot but all are well.